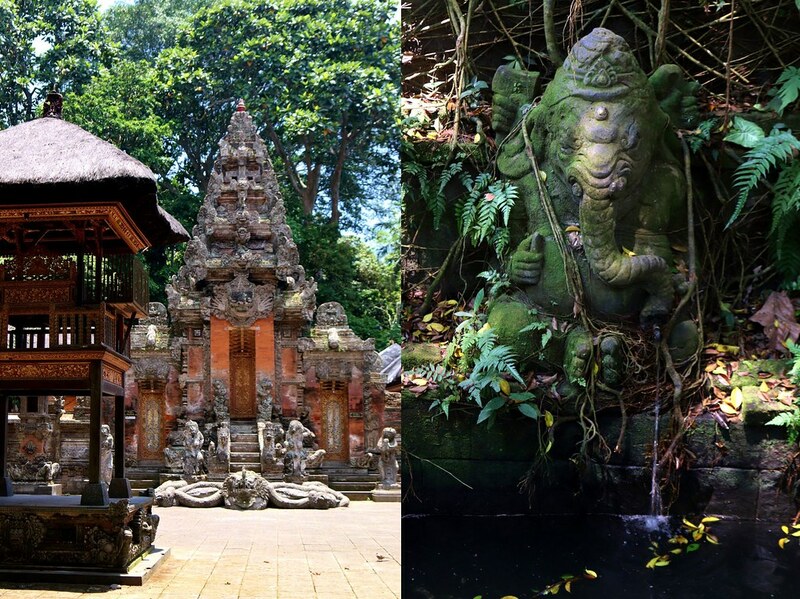 During our time in Indonesia, Pete and I spent a few days just outside Ubud, which is a something of a cultural and tourist hub in Bali. There were lots of things to do an see, and so today's entry from the travel journal is all about the famous (or perhaps infamous?) 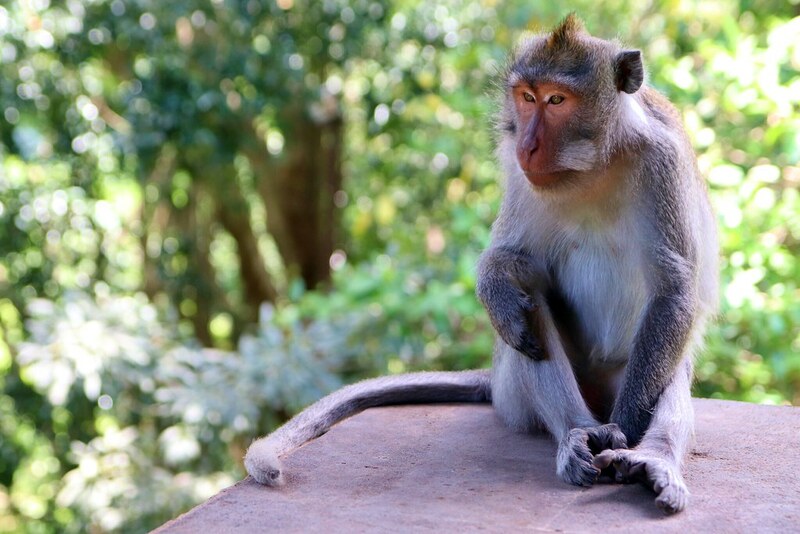 Monkey Forest, and our encounters with its most sought-after residents. 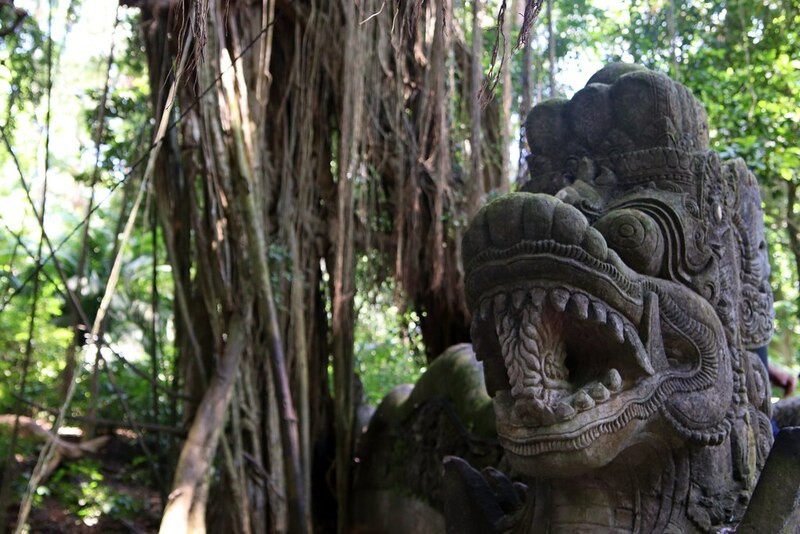 And if you are enjoying following along with our Indonesian Adventures, you can find more of them linked here. Our morning started with a much needed lie-in and we lounged in bed for a little while, dozing as the sun sun started it’s daily job of heating the air. Breakfast arrived and we tucked into fruit and omelettes merrily. 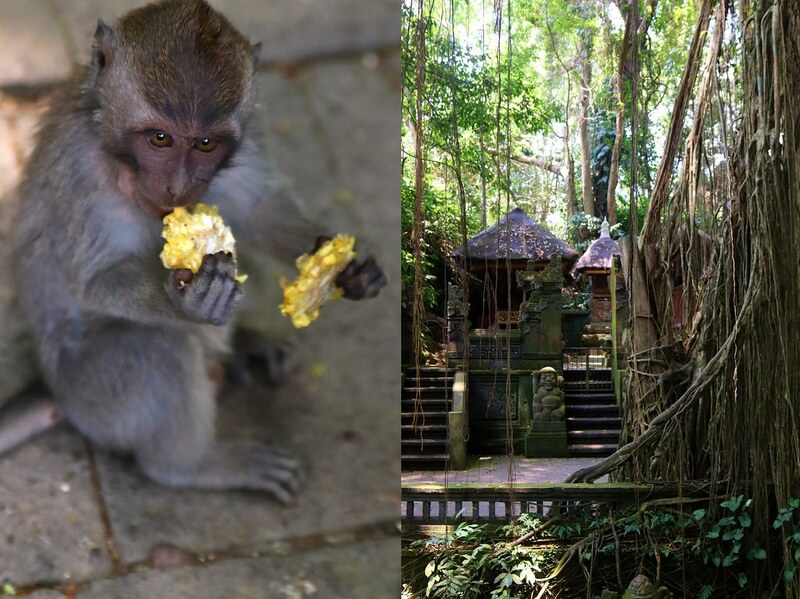 Our plan for the day was to visit Ubud, and we set out at 11:00am for our first stop: the Monkey Forest. It turned out to be much more of a thing than I thought. 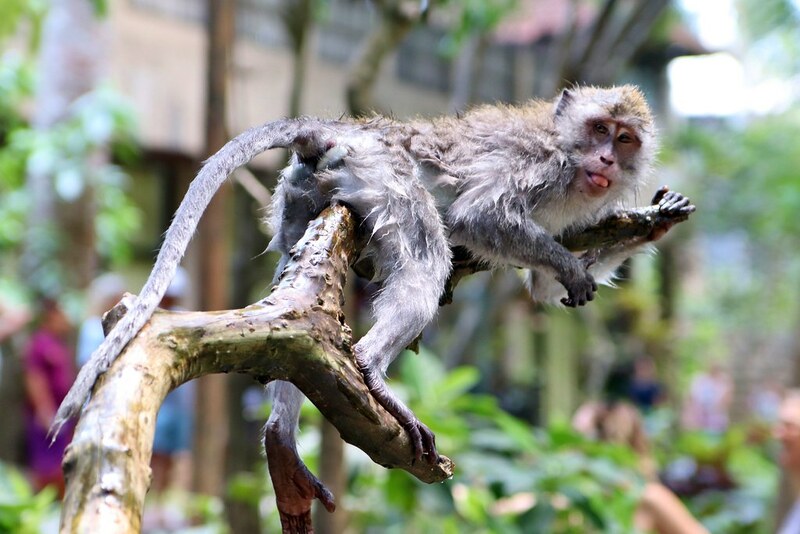 The internet had seemed to imply that you take your belongings and your life into your hands somewhat as you mooch through the jungle trying to avoid being attacked by rabid monkeys, and that you can then expect to spend the subsequent several hours trying to find a reputable medical centre to boost your rabies immunisation. 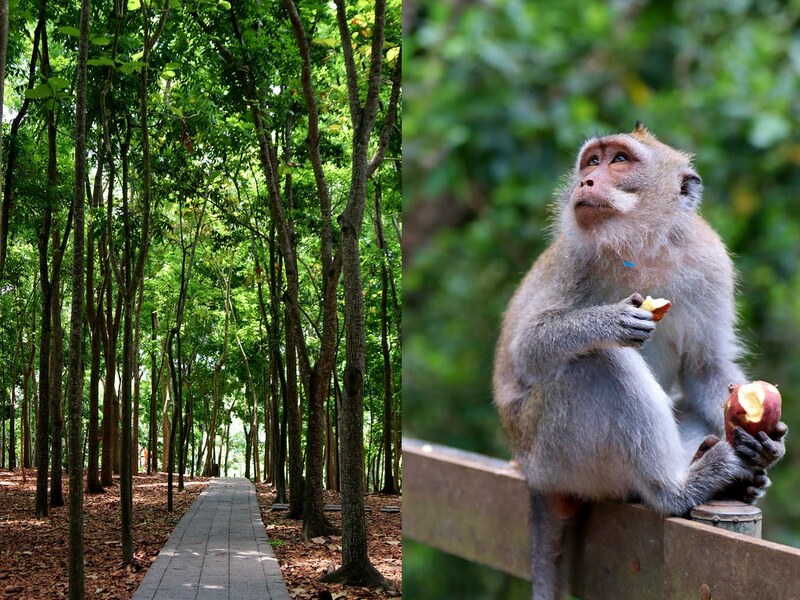 However, the reality was lovely: wide paved paths through the shady trees, a series of temples and structures looming out of the forest, spectacularly tangled vines and, of course, monkeys. They were everywhere and provided plentiful entertainment for the onlookers. 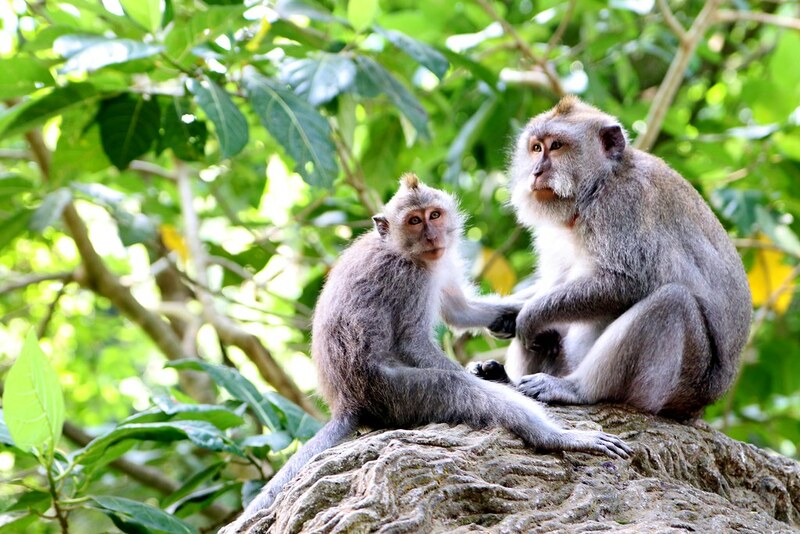 As is often the case, if you respect the wildlife and don’t behave like an idiot, the monkeys pretty much leave you alone. Signs advise not getting out any food or rustling packets at them, you are told not to touch them and to avoid eye contact as this is viewed as a sign of aggression. This of course doesn’t stop morons from trying to feed them, bait them and get an insta selfie. 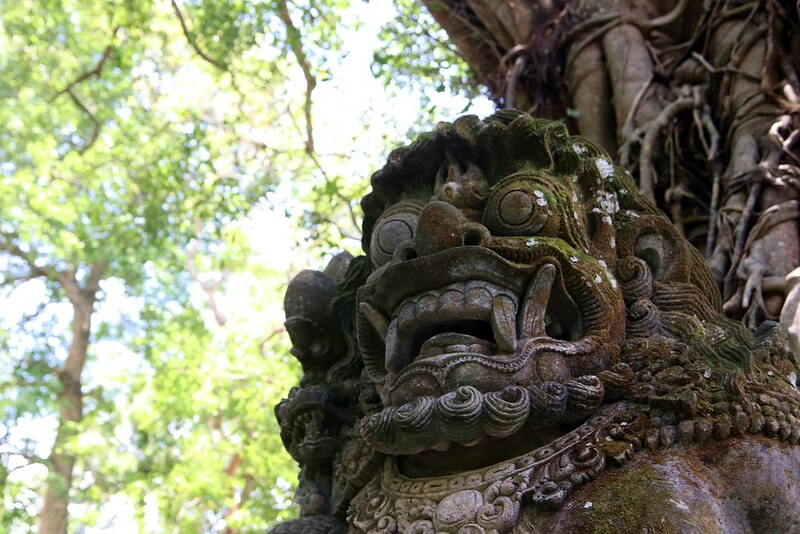 So we wandered about, admired the temples and giggled at the monkeys antics. There are 6 different troupes that live in the forest and they have split the territory up between them. Although they by no means stick to the forest if they don’t want to: cars parked nearby are fair game, for instance. 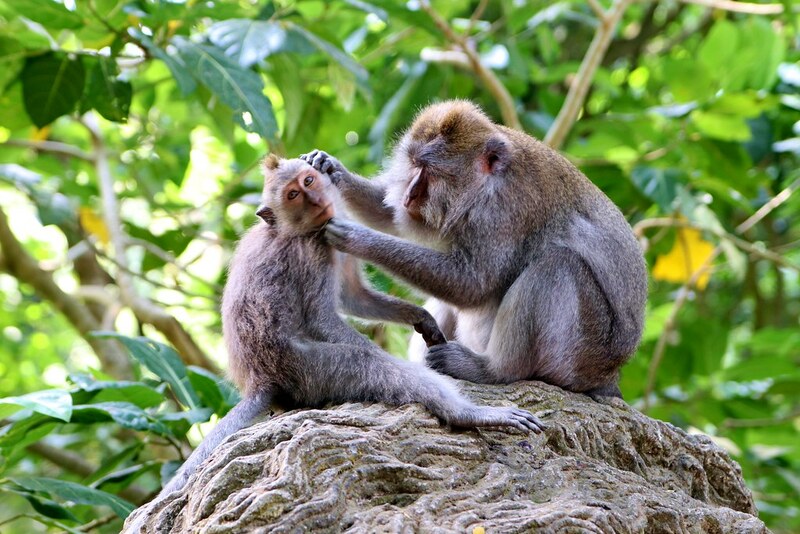 They’re clearly smart and have a hierarchy:larger, stronger ones baring their teeth and ousting the upstart juveniles; tiny babies clinging to their mothers’ tummies; slightly more confident infants attempting to gain their independence before being yanked back unceremoniously by the tail. The mums maintained a firm grip on the baby reins. We watched them play in and around a couple of trees over the pool, sometimes flinging themselves gleefully into the water while a friend or competitor dives after them with a screeching racket. They would hop out again undaunted but bedraggled, charging back into the trees. Watching them climb and navigate the trees was wonderful. They could cling onto and swagger along the most slender of branches, making all but impossible leaps to land with a crash amongst the foliage of the next tree. But it was never a crash landing and within seconds they would have attained new and loftier heights. They could practically run up tree trunks but more entertaining still was watching them slide down, fireman style, cackling away. We stopped by a feeding point and perched on a stone wall. There were sweet potatoes scattered over the floor and the odd monkey here and there was snacking. It was swelteringly warm and humid and even though we were in the shade, the weather was a bit energy-sapping at times. Moments later, a large male sauntered down the bank behind us and came to sit down. 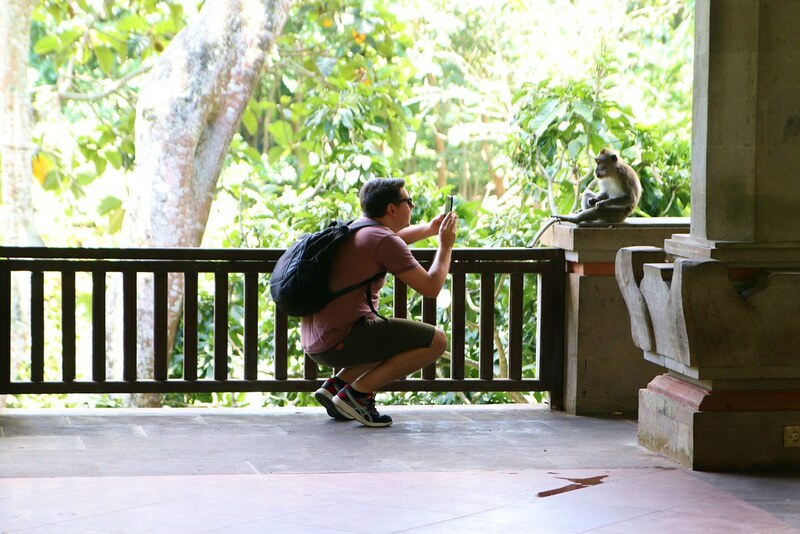 I got up and put a little distance between us but Pete refused to budge as the monkey approached. However, the monkey was not to be denied and instead of being halted, simply climbed onto Pete; he was amused but then the monkey very deliberately started to unzip our bag. I squeaked, Pete got up and managed to shake his passenger off but not without getting a face full of barred teeth and an angry rebuttal. These dudes are smart; he knew exactly where to go and how to do the zips. Very dexterous! 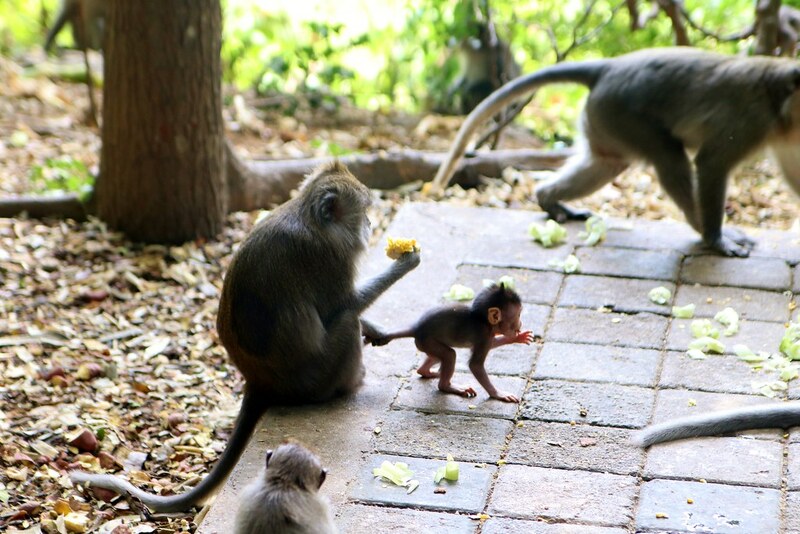 We continued through the monkey forest, arriving at another feeding station just as the warden did to dole out food. 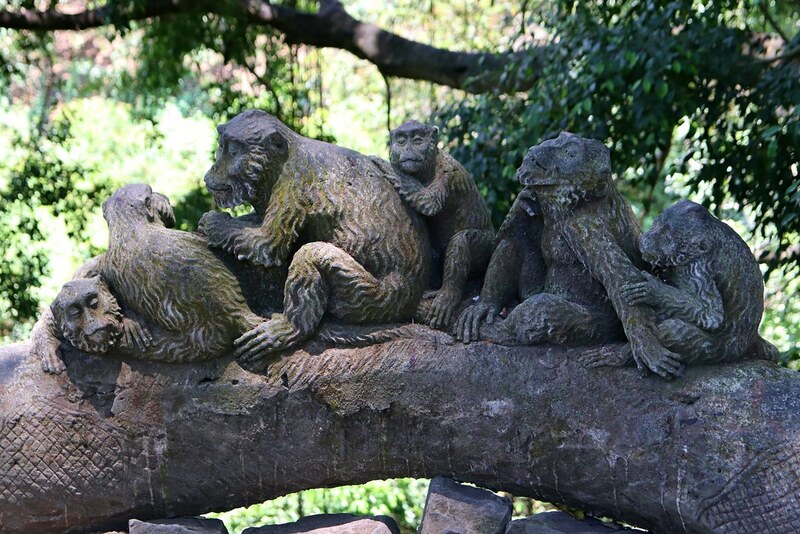 The response was immediate: monkeys descended from all directions, gathering round to divide up and squabble over the offering. They hoovered up corn on the cob, nibbling the kernels from the stalk and discarding the rest in disgust. They went even more nuts for the bananas. So cliched, darling. But they were funny, prancing round the trees, snatching food from the floor and each other, carrying away as many of the spoils as they could. Mothers fed babies, adults swatted at teenagers and everyone had a good old feed. Happy days! We wandered through the rest of the forest, coming across an old temple, crossing a stone bridge which arched over a gully through a tangle of vines, and marvelled at some of the most beautifully intricate and twisted trees I’ve ever seen. It was like a forest from another world; Pete commented that it reminded him of Peter Pan. 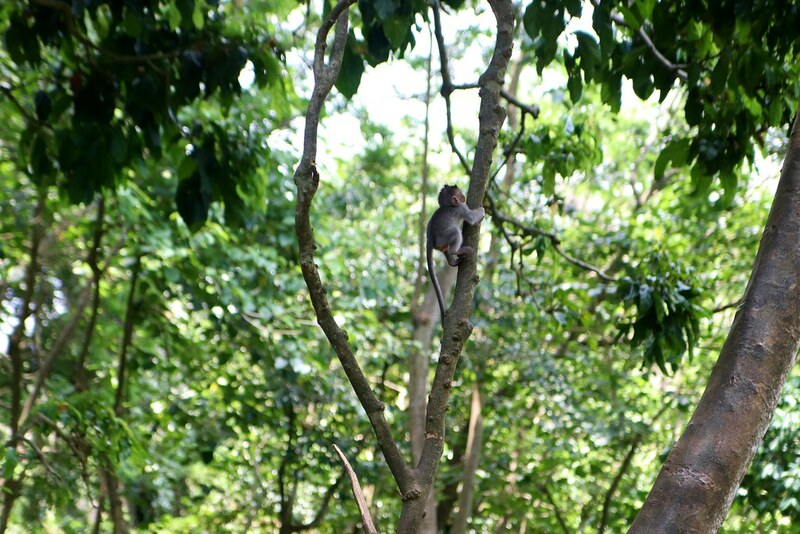 Leaving the forest, we had a quick juice and a banana smoothie to replace the sugar we had sweated out. The Indonesians will insist on adding syrup to their juice which is weird to me on two levels: first it makes it taste less like real juice and more like squash, and second, fruit is already sweet and full of sugar. So just: NO. Stop it already! 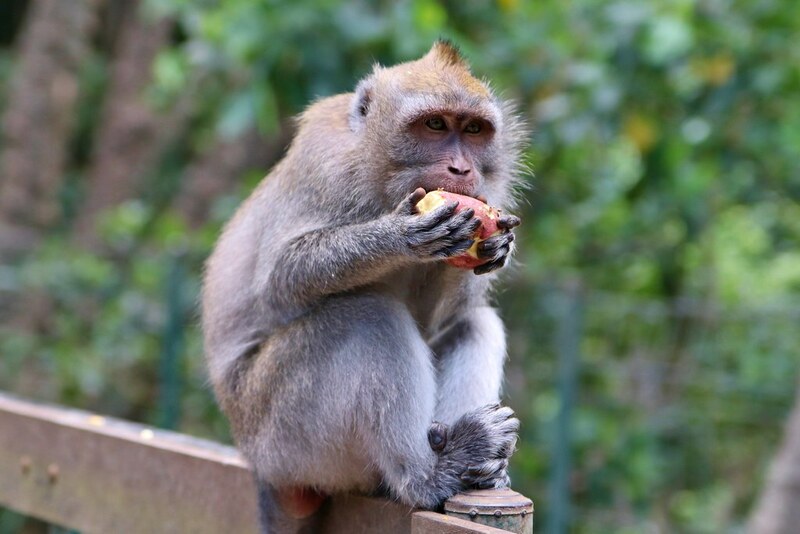 Fruit juice wasn't going to cut it, and clearly lunch was in order, so we headed into Ubud to explore. But that's a post for another day.